Hello, all you unlucky people out there who don’t have a Kindle yet. I have nothing but sympathy for you, because I am now the hap-hap-happiest person in the whole world because I just got a Kindle 2 for Mother’s Day. (Yes, it is true that I am the greatest Mom in the world–not). But I got a Kindle 2 anyway. And I love it. My daughter got one a couple of months ago and she has been so in love with it that she conned my husband and son into divvying up with her to buy one for me for Mom’s Day. So now I have one, too, and I am madly in love. It is the best thing that has happened to me since audiobooks on Audible and iTunes. But don’t worry, iTunes, we won’t be breaking up any time soon, because even though my Kindle will read the books to me, its voice capacity leaves a lot to be desired. But the downloads are virtually instantaneous from Kindle’s 3G wireless network and only cost $6.04, as opposed to around $25-$30 for the audiobooks on iTunes and Audible. Sometimes more. Sometimes much more. And you can turn the Kindle 2’s audio off and on quickly and easily, or choose from a male or female voice. You can choose from over 275,000 books (plus newspapers, magazines, and blogs) and your Kindle 2 will hold over 1,500 of them. The new Kindle DX will hold even more–4,500 books, but it’s bigger, pricier, and not yet available. I figure by the time I could collect that many books, something new will be out. Plus the Kindle 2 is lighter than a paperback and as thin as a magazine, but tinier, so it fits easily into even a small purse. 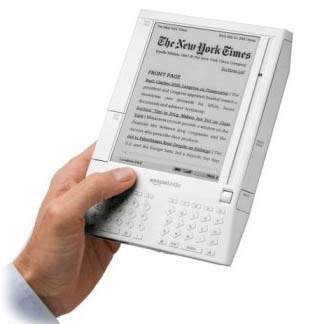 The Kindle DX also includes a native PDF reader, whereas the Kindle 2 has to convert them, and some complicated files might not convert perfectly. Most will, however. You can also obtain cool tools for your Kindle. I immediately ordered a cover/platform to use for hands-free reading by the pool and a tiny little nightlight for reading in bed. You can order all kinds of goodies from Amazon, the Kindle’s hometown. This is a link to more info about the Kindle 2 and all of its accessories. The Kindle 2 set my family back $359, whereas you’ll have to fork over $489 if you opt for the Kindle DX. And, oh, yeah, the Kindle 2 really is quite readable outside in bright light, unlike your evil laptop. And you can get documents (including the aforementioned PDFs) sent to you via email on your Kindle. I am so in love! Enjoy a revolutionary electronic-paper display providing a sharp, high-resolution screen that looks and reads like real paper. Thrill to ease of use with no computer, cables, or syncing. Wrap yourself in the luxury of wireless connectivity that enables you to shop the Kindle Store directly from your Kindle—whether you’re in the back of a taxi, at the airport, or lounging in bed. Purchase a book and have it auto-delivered wirelessly in under one minute. Revel in the 88,000 available books, including 100 of the 112 current New York Times® Best Sellers. Order New York Times® Best Sellers and all New Releases for just $9.99, unless marked otherwise. Delight to top U.S. newspapers including The New York Times, Wall Street Journal, and Washington Post; top magazines including TIME, Atlantic Monthly, and Forbes—all auto-delivered wirelessly. Expand your horizons with top international newspapers from France, Germany, and Ireland; Le Monde, Frankfurter Allgemeine, and The Irish Times—all auto-delivered wirelessly. Get your mitts on more than 250 top blogs from the worlds of business, technology, sports, entertainment, and politics, including BoingBoing, Slashdot, TechCrunch, ESPN’s Bill Simmons, The Onion, Michelle Malkin, and The Huffington Post—all updated wirelessly throughout the day. Stay skinny with its teensy size: lighter and thinner than a typical paperback; weighing only 10.3 ounces. Hold over 200 of your favorite titles. Celebrate its long battery life. Leave wireless on and recharge approximately every other day. Turn wireless off and read for a week or more before recharging. Fully recharges in 2 hours. Outdo WiFi, because Kindle utilizes the same high-speed data network (EVDO) as advanced cell phones—so you never have to locate a hotspot. Luxuriate in no monthly wireless bills, service plans, or commitments—Amazon takes care of the wireless delivery so you can simply click, buy, and read. Frolic over your free wireless access to Wikipedia.